We had a Sunday off from our regular MKMMA webinar this month. Because we had a day off, my husband said that he would take me to a movie I have been wanting to see. Very nice of him. But, he was also interested in the movie as he grew up loving sports and watching many sporting events. I think I should also give my husband a ‘shout out’ because he watched “Finding Joe”, another movie we were asked to watch for our course, about Joseph Campbell. My husband could clearly remember seeing this young lad in the 1988 Winter Olympics held in Calgary, Alberta, Canada, as the announcers and everyone there and watching were afraid for what would happen. The movie which is based on the true story, I am sure is not exactly what happened, as movies often add a few things to make it more thrilling. I did hear that the coach that they show, was not actually one person but a culmination of people that helped him rolled into one. Also I understand he had to sleep in an old shed and eat leftover foods – but the important factor is that when you leave the theatre you do believe that if you believe in yourself and hold your dreams, anything is possible. 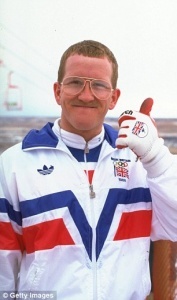 I understand that Olympic rules did change after Eddie the Eagle was able to compete, and the movie showed rules changing trying to keep him out of the Olympics. Eddie’s story is one of the “Hero’ Journey” He had the courage to go out, despite all odds and everyone telling him he could not accomplish his dreams. He slayed dragons and set-backs along the way and came back the hero and shared his accomplishment with many! As a young child he had a brace on his leg and he was not able to participate in sports. He wasn’t picked for teams and he was made fun of. But the movie showed him with posters on his wall, the book of Olympic ‘ bests’ always in his possession and mind. He tried every sport he could think of, with whatever piece of materials he could use to try a sport, with poor results. For example, pole jumping onto an old mattress in a back alley, but the wooden pole he found broke. He would try and hold his breath in the bathtub to see how long he could hold his breath. Cheering he was a champion every time he would do better. He was ridiculed by many, but he did have his mom’s support. She would often see him heading out the door with his backpack and ask “Eddie where are you going” “Off to be in the Olympics, mom”, he would respond. And sometimes she would give him an old tin box, maybe with a sandwich inside, and say “Well then you might be needing this, box for your medals” to which he would respond “Thanks Mom”. Then the mom would tell the dad to get out the Van and follow Eddie to the bus stop so he could convince him he should come home. The dad was always saying that Eddie had to be realistic and join him in his business, that he was not an athlete and never would be. Eddie would try and make his dad happy, but he could not shake the fact that one day he would compete in the Olympics despite all. 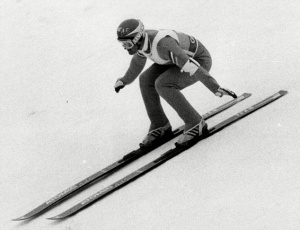 But on with the story, Eddie finally got pretty good at downhill skiing and thought he was on his way but the British Olympic committee told him he really did not have what he needed, and told him it was not going to happen. He finally figured out that if he could become a ski jumper, the Olympic committee would have to let him go as Britain did not have a jumping team. He faced more challenges – and when you figure most competitors start this sport about age 6 or so and Eddie had a year or so in the movie to succeed, he uses his persistence to find the people that can help him. And, of course, his mom was his biggest support again, despite the dad not wanting to use their savings on his son’s crazy dreams, the mom gives him the money and tells him to take their van as well to get him to Germany to train and ultimately to go on the European tour. I think it is important to note that Eddie was always very grateful to those that helped him and even to those that deterred him, he would wish them a good day. He would always take a negative comment and substitute a good thought for it. And, that is what we are learning in the MKMMA course. Even after he makes it to Canada, he has to get past a mean team-mate getting him drunk so he misses his dream of walking into the Olympic stadium and his mentor giving him a hard time about how he makes a fool of himself in front of the crowd, because despite the odds he does make the jump on the 70 m hill, coming dead last, but a best for his country. Eddie is elated and the crowd loves that he is jumping, cheering and waving his arms like a bird. And they begin to cheer him on and all of the reporters want to hear his story. Because of the wing flapping they dub him Eddie the Eagle. Because of his mentor telling him he did not act correctly after the win, he decides to jump in the 90m competition – a jump he has never made before and has seriously injured many an experienced jumper. Now during the actual Olympics, this is where my husband and all watching were so upset he was going to kill himself. Many said he should not be able to do it, but at that time they could not dig up any rule to prevent it. But Eddie made the jump and a personal best. Despite all of the obstacles, he became an Olympian and one that many will never forget. He focused on his dream every day and it came true. Wishing you all the patience and focus of an eagle, to soar on wings of gratitude to your dream! Thank you for sharing this inspiring story Connie!! Isn’t it a great Hero’s Journey story. I was sure motivated by it. Have a great week 23! Thank you for sharing and the “Thumbs Up” on the movie! I for sure want to see it now! I love a good ending for the underdog. Your posts always leave the reader with feelings of Hope. As Always, Much Aloha Connie?? hey Sherry – thanks for always leaving such kind, positive comments. It didn’t realize I left people with Hope, so that is good – sure try to help, but not always sure I do. A shout out to you that you were chosen for blog of the week – well deserved. You will have even more followers. Nice! “Wishing you all the patience and focus of an eagle, to soar on wings of gratitude to your dream!” That needs to be on my wall. Thanks for the share. Wow, what a kind comment! Really always appreciate to hear from you. The movie is still in theatre, but yes, it is sure a hero’s journey! Soaring like eagles and loving our very own hero’s journeys! Way to go, Connie! Thanks you brought tears of joy to me. Awesome post. Thank you for your very kind comment. I am glad you enjoyed it. His story sure is inspirational. Well! Looks like that’s another movie I must put on my list. How long till it is on Netflix? Great blog Connie. Another tear jerker.